We live in a time when our whole country is traumatized by hate and bullies. Wonder is a heartwarming reminder that for every bully, there are many others around who are kind and loving. I personally want to thank Wonder for the reminder. With a long weekend coming up, you may have some free time to catch up on the TV. I’ve put together some ideas for you. The things I recommend are the best of the best of what I’ve seen among recently streaming choices. Hope you enjoy some of it. There are many films that can make you feel as if you’ve been assaulted by life, by pain, by damage and abuse, by hurt. August: Osage County is one of these. It peers into the way abuse and pain carries down, almost intact, from one generation to the next. In this particular story, the damage is inflicted by the women. The story begins with a father’s death. Sam Shepard as the Oklahoma poet Beverly Weston dies. The family gathers. Meryl Streep plays Violet Weston, the not-exactly-grieving widow and mother to Julia Roberts, Julianne Nicholson, and Juliette Lewis. Violet Weston has cancer of the mouth, both physically and metaphorically. She’s addicted to about 11 different prescription drugs, which she pops with malicious intensity. The drugs do not have pleasant effect on her behavior. Julianne Nicholson as Ivy is the daughter who stayed in Oklahoma, near her parents. Julianne Nicholson’s performance in this part is quiet and nuanced and complete perfection, especially when contrasted with the overblown emotionalism of some of the other characters. Okay, not some of the other characters; Meryl Streep’s character. She seemed too big somehow, too much. I’m sure Meryl Streep intended her to be too big and too much. The woman doesn’t make mistakes. Violet Weston was too big and too much on purpose, I’m guessing. Julia Roberts drives in with her husband, played by Ewan McGregor, a buttoned down kind of man, and her 14 year old daughter, played by Abigail Breslin. Her marriage is breaking up. Julia Roberts is simply wonderful in this part. She’s the eldest daughter – strong and bitter and angry. She’s the wronged wife with a cheating husband. She’s the protective mother whose 14 year old daughter attracts the attentions of her sister’s smarmy fiancé, played by Dermot Mulroney. She’s a wounded lioness, just like her mother, with sharp teeth and powerful claws. Juliette Lewis has her own coping mechanisms for dealing with her family. Get as far away as possible, pin all sorts of unrealistic hopes and wishful thinking on a man, and pretend the realities of her upbringing never happened. Add to this menagerie of family Violet’s sister, Mattie Fae, played expertly by Margo Martindale. She’s married to Chris Cooper. Like Violet’s husband, Mattie Fae’s husband is a kind and tender man. How did these two sisters manage to find such good men to marry? They have a mother-whipped cowering mess of a son played by Benedict Cumberbatch. Bring all these characters together for a funeral, make them stay together for several days, and all hell breaks loose. I want to give a particular mention to Misty Upham, who plays a Native American woman hired by Beverly to cook and clean just before he goes missing. (Perhaps you remember her from Frozen River , where she had a bigger part.) Misty Upham needs to be pulled out of the Native American niche and put into other roles. She’s terrific and should be given parts that aren’t so bound by ethnicity. Hey, Jinji Kohan, how about giving her a part in Orange is the New Black where actresses are judged not by the color of their skin but by the content of their characters? This story is brilliant in its specificity. It’s filled with outstanding performances. Any awards that go to August: Osage County are deserved. Like a lot of movies that deal with harsh reality, it’s hard to watch at times, even though it has moments of redemption and beauty. I recommend August: Osage County wholeheartedly. It’s not the kind of movie you want to watch more than once, but it is the kind of movie that should be watched. The Guardian tells us that Diane Keaton plans US remake of BBC’s Last Tango in Halifax. It will air on HBO. Sally Wainwright, the creator of the show, says she will be a producer of the American version but will not have a huge role in the production. I know I have lots of feelings about this news, and I’m sure the dedicated Last Tango fans do, too. First, where would it be set? I just made up the part about Santa Fe. It’s a cool place, there are ranches surrounding it, and a lot of films get made in New Mexico. It might be a sensible location for a series that needs both urban and rural settings along with great scenery. Diane Keaton has not asked for my opinion in this matter, however. Who would be in it? Would Diane Keaton play Celia? She’s 67. What American actresses are in their 70s? Shirley MacLaine, Barbra Streisand, Faye Dunaway, Jane Fonda, Ellen Burstyn, Olympia Dukakis, Julie Christie, Candice Bergen are a few possible names. So we have talent in that age category, but American women don’t look their age. That’s a bit of a problem. Do we want to see anyone who doesn’t look as genuine Anne Reid in the role? There are simply tons of older men to choose from for Alan. Robert DeNiro, Robert Redford, Harrison Ford, Peter Coyote and dozens more. 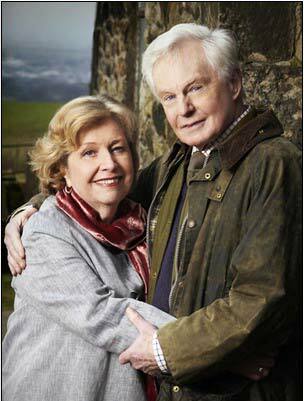 But I so like Derek Jacobi’s sweet and loving Alan. Some swaggering American who is used to waving a gun around just doesn’t feel right. And 70 year-old American men still fancy themselves leading men who should be snaring women 30 and 40 years younger than themselves. That’s a bit of a problem, too. As for the feckless John, Tony Gardner was perfection in this part. Who could equal that? What about Caroline and Gillian and Kate? Remember my dream actress pairing of Ashley Judd and Jennifer Beals? Think they’d make a good Caroline and Kate? Other actresses in their 40s abound, include Sandra Bullock, Halle Berry, Jennifer Lopez, Cameron Diaz, Julia Roberts, Jennifer Garner, Renée Zellweger and lots more. But I’m sort of convinced that Sarah Lancashire is irreplaceable as Caroline. Nicola Walker in her jeans and Converse sneakers brings such nuance and subtlety to Gillian. Casting is a challenge. Adapting the dialog and locations will be a challenge as well. Diane Keaton has taken on a huge task to make this wonderful story American. I wish her well, and I wish her great luck finding the right people to do the writing and casting and create the sets. I’m really attached to Last Tango in Halifax . Even so, Diane Keaton is trustworthy, in my opinion. If anyone can make a love story about older adults shine, it should be Diane Keaton. Who knows, I may love the American version of this tale of second chances as much as I do the British one. When I get attached to a show, like the Millennium series in Swedish ( The Girl with the Dragon Tattoo , The Girl Who Played with Fire , and The Girl Who Kicked the Hornets Nest ) I feel a vague dread at the arrival of American versions. Then I go see it (of course) and I like it on it’s own merit. It isn’t the same as the original, but it still has the characters and the story and I end up enjoying both versions. I’m ready to see what happens to this lovely British tale of second chances. Go, Diane! The second series of Last Tango In Halifax, one of BBC1’s biggest-rating new shows of 2012, launches next month and a third is planned. A big hurrah for season 3. 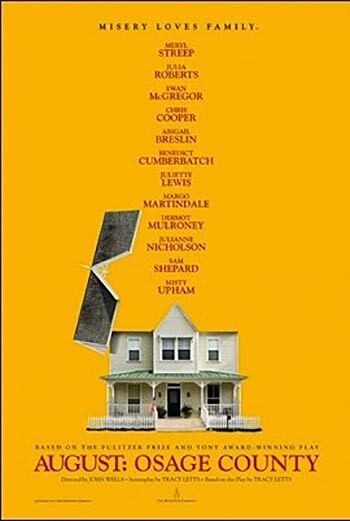 August: Osage County is the most promising movie, story, cast, whatever, to come along in a very long time. It’s a family drama with many strong women called together by a family crisis at their childhood home in Oklahoma. It’s based on a Pulitzer Prize winning play by Tracy Letts. Letts also wrote the screen play for the film, which debuted this week at TIFF, although it isn’t scheduled to be released in U.S. theaters until December 2013. Take a look at the trailer. What a cast! Meryl Streep is the family matriarch, Violet, who suffers from mouth cancer. Sam Shepard plays her husband – an Oklahoma poet who quotes T.S. Eliot. This couple have three daughters played by Julia Roberts, Juliette Lewis and Julianne Nicholson. Roberts is married to Ewan McGregor. They have a daughter played by Abigail Breslin. The sister played by Juliette Lewis arrives with a man in tow, played by Dermot Mulroney. The Julianne Nicholson character lives near her mother, something that probably makes her an expert on the family dysfunction in a way the two other daughters haven’t experienced. Other characters include Violet’s sister (Margo Martindale), her husband (Chris Cooper) and their son (Benedict Cumberbatch). If that list of names isn’t enough to get your attention, the producer is George Clooney. Early reviews coming out of TIFF are favorable. Julia Roberts in particular is attracting attention for her performance. It must be an intimidating proposition to try to stand out in a cast like this one, but Julia Roberts has apparently achieved that. Abigail Breslin – if my math is right – is about 17 now. We’ve been watching her grow since Signs in 2002. She’s been in Raising Helen , Little Miss Sunshine , My Sister’s Keeper and much more. In every part she’s had, she’s demonstrated brilliant talent. Now she’s nearly “all growed up” and will be playing adult parts in the future. This may be the last time we see her as a teen or as someone’s daughter still under the parental wing. August: Osage County is obviously complete or it couldn’t be playing in Toronto at a film festival. Yet we have to wait until December to see it. This means it will be released with prime Oscar nomination timing. The last thing we see in a year always has a better chance of getting the Oscar votes than something that comes out early in the year. Wouldn’t it be fun to see Julia Roberts get an Oscar nomination out of this one? Or how about a movie by a female writer and full of fabulous female characters getting a nomination as best picture? Now, that would be pretty damn wonderful. UPDATE: A second trailer for the film is out now.